The Spinsterhood Diaries: A Real Fashion Office. Today we're going to talk about fashion again. It's what I do for a living, so of course I think about it a lot. But first let me start properly. My dad is one of the only people I know who doesn't like to watch Law and Order. While I can't understand someone being able to resist the show in any of its forms, I suspect his lack of interest has to do with his being a lawyer himself. Basically, to him, it's not believable. I feel the same way about any fictional representation of fashion design. Ever. There are more misconceptions and misrepresentations of fashion design out there than I can cover in one readable article, but today I'll just tell you about one. In fact, I'll confine it to one: The office. Whenever fashion offices are depicted on television or in movies, designers always sit at sleek glass-top desks or at drafting tables, draping and sketching by hand all day as they look out their floor-to-ceiling windows in a sun-drenched loft space full of bolds of fabric. The bolts of fabric are true of only one place I've ever worked, but the office space depiction is just wholly untrue. In reality, fashion offices are more likely to be a giant room, potentially with low ceilings and carpeted floors, packed to the hilt with cubicles, computers, and malfunctioning printers. In short, it's just a regular office. And we do our sketching on the computer if we want to be efficient and not waste any time. It has to go in the computer at some point, so you might as well just make it in Illustrator from the start. Storage is also ridiculously scarce in a fashion office. It's as if no one is willing to admit we are having things made and sent to us at a much faster rate than we are allowed to dispose of them. The minute you rid yourself of a two-year-old sample is the exact minute someone will ask where it is, making you look disorganized and unthinking. As a result, there's just stuff everywhere. There are rolling racks in the aisles full of unremarkable and mutilated clothing bought for some minute detail or entire concept kept only in the mind of the buyer and the sketcher. Sometimes it's literally just about a seam or a stitch. There are stacks and stacks of 24" x 36" foam core boards leaning against any and all surfaces perpendicular to the floor with little bits of paper pinned to them showing a "feeling," an "attitude," or potentially just a style someone's straight-up knocking off. And then you have the printers. I have worked in five different fashion offices, and not a one of them has had a properly functioning printer. There is an incredible amount of paper-wastage in the fashion industry as everyone needs a hard copy of everything or to pin a printout to a board, but I don't think anything wastes more paper than those stupid printers with their constant paper jams. And the printers are forever beeping at you about some thing or another. But mostly they're just eating your printouts or putting stripes all over your sketches or rubbing ink everywhere. But then you have the showrooms. The showrooms have different names at every company, it would seem. No one can just call them showrooms, but that's what they are. 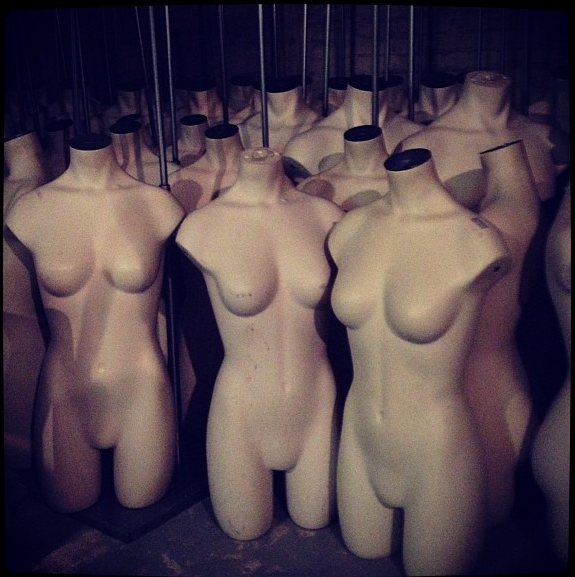 The showrooms are pristine, embalmed rooms full of dressed mannequins and interior decoration to evoke the total "feel" of the brand or customer or "girl." People get cray when it comes to the showroom. Just today a team of people whose job it is just to decorate the showrooms at my company came in and pretty much renovated one of the rooms in our office, leaving it sparkling, new, and fairly unrecognizable. These people are magicians in my book, but sometimes it's really hard not to see it all as very wasteful. And that, my friends, is all I can say about the fashion office today. I hope you have enjoyed this little peek inside. There is plenty more where this came from!